ROCKVILLE, Md., Oct. 30, 2018 /PRNewswire/ -- Choice Hotels International, Inc. (NYSE: CHH) signed an agreement with Brookwood Hotels to develop more than 20 new WoodSpring Suites hotels over the next few years. The brand now has more than 130 hotels in the pipeline and more than 245 are open. WoodSpring Suites hotels offer extended stay guests a welcoming environment and straightforward stay – all affordably priced. 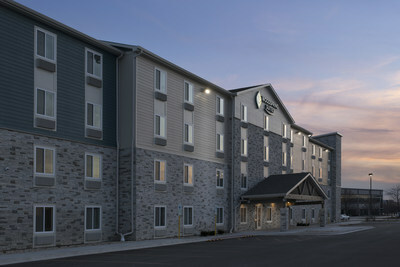 Franchised by Choice Hotels, WoodSpring Suites is the nation's fastest-growing economy extended stay hotel brand. Each property is newly-constructed and built to anticipate the needs of travelers looking for a longer-term stay. Properties feature all-suite rooms with fully-equipped kitchens, flexible workspaces, and guest laundry facilities. There are more than 240 WoodSpring Suites hotels open in over 35 states and nearly 100 in the pipeline across the country as of June 30, 2018. For more information, visit www.woodspring.com/ourbrand/. Brookwood Hotels (the "Company") is a hospitality platform company which was formed simultaneously with the acquisition of the WoodSpring Suites brand by Choice Hotels in February 2018. The Company owns more than 100 hotels in the economy extended-stay segment across the U.S., with the largest concentration in Florida. The Company is owned by a Brookfield Asset Management (Brookfield) -sponsored private real estate fund.